Director Pete Travis is no longer the law. 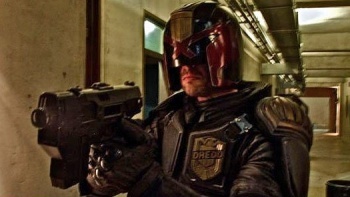 1995's Judge Dredd is not exactly remembered fondly. Sylvester Stallone did as well as an Italian-American with a speech impediment could with the role, but many longtime fans felt the film didn't do justice to the comic book source material. A reboot of the IP was shot this year, starring Karl Urban of Eomer (LOTR) fame, but there is trouble with the production. The director Pete Travis - who made Vantage Point in 2008 - has apparently been ousted from the production with the screenwriter Alex Garland taking over editing Judge Dredd. Garland has some prestigious writing credits - 28 Days Later, and the game Enslaved: Odyssey to the West - but he has never directed a film before. No one is really sure what caused the discord but all signs point to creative differences between the screenwriter and the director. With Travis ousted from the editing room and the producers, Andrew Macdonald and Allon Reich, might even give Garland a co-directing credit which is unheard of in Hollywood. A source close to the production said that Garland, who is also listed as a producer on the film, would have to petition the Directors Guild of Great Britain for the credit change. I may be biased, but I think the writer taking over is a great idea. Garland has earned a lot of credit for me for penning great scripts and it's clear he has support from the backers of the film. I feel bad that Travis has been edged out, but I feel more comfortable with a competent screenwriter at the helm than an incompetent director.